How do you respond when a colleague you respect is drinking at levels which affect their work? How do you address this if you are their manager? The awkward realisation that ‘something must be done’ when drinking affects work has challenged the most competent of managers and put many co-workers in difficult situations. The truth is around a fifth of adults in the UK drink at levels that could harm their health and for some this may spill over into the workplace. Not all workplaces breath test their staff so the majority rely either on staff to come forward, or on colleagues or managers to address the problem. Thankfully, we can learn a lot from what we know works in health settings, using the FRAMES approach (Miller and Sanchez 1993). The best approach is a collaborative rather than confrontational one – this is more difficult if you are a manager and you are concerned about one of your staff , but if this is the first time you’re talking about your concerns, you can attempt to keep the discussion informal if possible. Share your concerns as objectively as possible – what are the risks for the individual if their drinking is affecting their work? What could happen to them if their drinking continuously affected their performance – are their any safety concerns with their job? Be pragmatic about risks for their job security – how would this be judged in light of the company alcohol policy? It is important to stress that you are on your colleague’s side – you may be concerned about their drinking behaviour and how this impacts on their work, but state that you are primarily concerned about their welfare. It’s also their responsibility to decide what to do, not yours. If you’re aware of any support mechanisms your organisation has for staff concerned about their drinking, make sure your colleague has access to this information, or help them find out. Some companies have excellent occupational health teams who will advise staff in complete confidence. Many organisations have policies that protect staff who come forward with a problem, as opposed to discovering a problem once its clearly affecting their performance. There are also a number of self-help resources online, especially on the NHS Livewell website or Down Your Drink, a self-help tool from University College London. Ultimately, you need to alert your colleague to the continued risk to their livelihood and potentially other’s safety if their drinking behaviour is not addressed. They can certainly change if they decide to although they may need to get support online or face to face to do so. If you are a manager, there is excellent e-training available on how to use this approach from the Department of Health. Similarly, if you need guidance on developing an alcohol policy, the Health and Safety Executive have their own useful guide. In summary (and in short! ), honesty is always the best policy. IBA – making it happen? It’s no secret that the big challenge is to get IBA happening large scale. That means in such a way that it will reach many of the 10 million or so adults regularly drinking above the guidelines. Simple ‘brief advice’ offered to most of them, and an offer of referral for those indicating possible dependency. But the challenge of widespread delivery will take time, if indeed in can be achieved. Why? Firstly, people are busy, and as recently explored, those roles that we need to do IBA may not realise it, and will often take some convincing. IBA is not the job of drug or alcohol specialists, it is the job of busy front-line health and social care roles. They need training firstly, so they have the necessary skills – and often just importantly the confidence – to ask about alcohol. IBA e-learning is easily accessible, but face to face training is better to practice skills and retain learning. Even so, training alone won’t result in implementation. 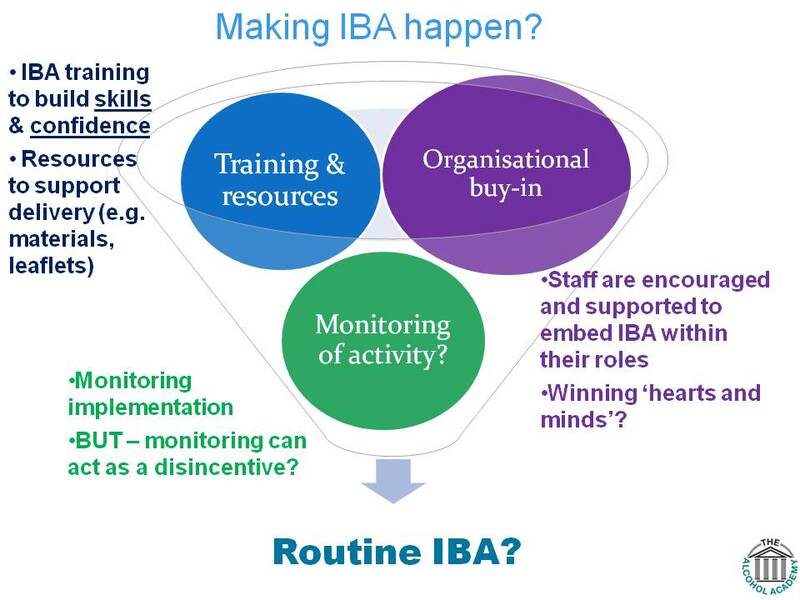 For those trained in IBA to go on and implement it, there often needs to be more. Their organisation needs to support and encourage them. Why should they do it if no-one is monitoring it or can offer encouragement or recognition? Access to resources is also needed – leaflets and tools to support IBA can be downloaded and printed, but making them easily available in printed form helps. ‘Hearts and minds’ is what’s really needed. Hopefully the increasing training, resources and organisational buy-in will all help build the momentum. But most busy front-line roles will only ‘go the extra mile’ when they see IBA as important – even if they won’t see the outcomes.